The 2003 performance Procol Harum: Live At the Union Chapel is now out on blu-ray courtesy of Eagle Rock. In December 2003, Procol Harum filmed a concert in Islington to close the tour promoting the band's 2003 album The Well's On Fire. 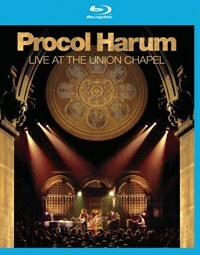 First released in 2004, Procol Harum: Live At the Union Chapel is now out on blu-ray courtesy of Eagle Rock. Though a great many people will know Procol Harum only by their biggest hit, 1967's "A Whiter Shade of Pale", there are many other strong songs here, both old and new. Original members Gary Brooker on vocals and piano, and Matthew Fisher on organ, lead their fellow musicians—and the rapt crowd—through a set that includes newer tracks, like early highlight "An Old English Dream", as well as several '60s hits such as "Homburg" and "Conquistador". Whether or not you're a fan familiar with each song, you can't help but be struck by the power behind this performance. Each of these songs is capable of pulling you in and paralyzing you with its beauty and compositional perfection (I was fully immobilized by the middle of "Weisselklenzenacht", not halfway through the show), but take them together, put them in the awe-inspiring setting of Union Chapel, and there's the potential to be struck dumb long after the disc stops spinning. Though the band took a break about 45 minutes in on the night of the show ("For a beer. "), as presented here, the music never lets up. It's one stunner right after another, and everyone there knows it. It's refreshing when a concert DVD lets the songs speak for themselves, and, visually, Live At the Union Chapel has no flash camera tricks or staging gimmicks, but plenty of atmosphere. "The Question" is a good example of this. Its ominous tones deepened by a stage in shadow split with washes of red lighting, and generous close-ups on different players and solos. Pay attention during the call and response between Fisher on the organ and guitarist Geoff Whitehorn on this one, not just because you'll hear snippets of "Layla", but because it succinctly demonstrates the prowess of these musicians. The Procol Harum: Live At the Union Chapel blu-ray includes an interactive interview with Gary Brooker, a film montage of the band earlier on the day of the concert, a "comments from the bar" feature, and the option to view the concert from alternative angles. The concert is presented in widescreen, and it looks OK, but not fantastic. It's the audio that really should be the star of this blu-ray, but sadly, it just isn't. The audio setup choices are Dolby Digital 5.1, DTS HD Master Audio and PCM Stereo, and it doesn't seem to matter which you choose, somehow it comes over a bit flat. Even during the truly dynamic moments, everything seems to have been mixed too evenly. This detracts, particularly, from the expected bombast of "Conquistador", and it keeps the encore tunes "Whisky Train" and "Good Captain Clack" from reaching the energy levels one wants. However, even muddled, middling sound can't mar the majesty of the long-awaited final encore. "A Whiter Shade of Pale" is a spell-binding song led by a magical melody on Fisher's Hammond, and it's a treat that Brooker sings it here with the extra verses not found on the single. For some, perhaps, that's reason enough to check out this blu-ray. Procol Harum fans who weren't fortunate enough to attend this show will want to give it a look, as will anyone who is interested in an introduction to these epic songs—though once the songs have caught you, you'll want to seek out superior sound quality.